On this page we present the KISI activities in Belgium – at the moment that is mainly in Flanders. Have fun! The information on this page is about KISI in Belgium. Are you looking for general information about KISI? KISI is originally from Austria, but here we will tell you more about its development in Belgium. the first KISI musicalcamp took place in Belgium. Then a group from Flanders came to the Dutch KISI-Feest and there the dream was born to start KISI in Belgium, too. Soon more KISI activities followed. the group from Flanders played two different musicals. There were two musical camps and different concerts – and of course the KISIs from Flanders visited the Dutch KISI-Feest again. 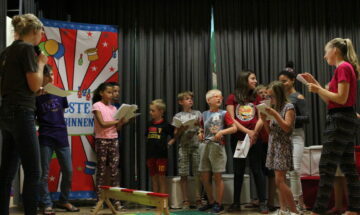 our first musical CD was recorded: "Lilli and the unbelievable comeback" with many kids from Flanders. 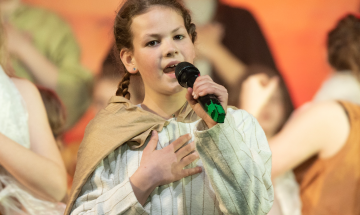 three KISI CLUBs were founded in Belgium and a new musical was trained and presented. There are musicalcamps in Belgium on a regular basis. You want to know more about the KISI history? Pauli, the adventurous little Lamb known from the KISI puppet shows, loves to be on the road – in kindergartens, schools or youth groups. Together with his family Wolliweiß he tells stories and sings about the adventures with his good shepherd. Three days of faith, fun and fellowship: every year the big KISI-Fest takes place and the program is filled with musical performances, workshops, outdoor-programs and some just as entertaining profound imputs for the whole family. If you work with kids, you deserve good training. We hold regular training seminars for our staff members and interns to equip them with the necessary skills for their work. Occasionally some of our events are also open to the public. Unfortunately we cannot be everywhere at the same time. However, we still make our hope and joy accessible for everyone. You can listen to our radio broadcasts weekly - unfortunately currently only available in German. Breathe some KISI air for a few hours: sing, dance, play and learn about Jesus – those are some of the things you will experience during our workshops. 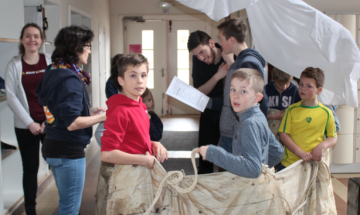 We come to parishes, schools or to other open events, to spend time with children. At the end of a workshop an arranged mass or a small concert consisting of songs, is possible. Learn a whole musical from scratch in only a few days? Sounds crazy, but it's possible. At KISI children train for a whole week in areas such as singing, dancing and acting for one specific KISI musical. They then have an opportunity to present their work in a final performance. Of course, we provide fun program too, which focuses on the themes featured in the musical. Do you want to be part of KISI on a regular basis? KISI NOW is a nationwide group that meets once a month, for a weekend, over the time span of half a year, to have fun, to pray and to rehearse a musical that will be performed at the end of the 6 months. KISI the intensive way: with KISI KEY you commit to a whole year with meetings at least once a month for one weekend. During these meetings, you train, rehearse intensively and focus on playing musicals & co. There are also opportunities for you to invest in deepening your relationship with God. KISI KEY is on tour and on the road a lot. Children have been wearing their KISI shirts proudly over the past twenty years, the same goes for KISI caps, KISI sweaters and other KISI products. We love how every KISI fan can literally wear their enthusiasm and that way share it with the world. Lovingly narrated and creatively illustrated: you can read about the adventures of Pauli, the funny, little, black sheep. Great for bed-time stories or to read on your own. All of our musicals and most of our songs are available on CD. A few of our musicals even exist on DVD. Now you can even experience KISI at home on screen or give CDs and DVDs away as presents! To sing along, to join in on the piano or on the guitar, violin, ukulele or any other instrument you like. Our songbooks provide you with the sheet music and chords to all of our songs and even contain the spoken words from the musicals. Are you looking for new ideas and concepts for your children or youth work? We would love to share our experience and have assembled our best ideas in compact hour-long programs that you can download in our shop. Are you looking for KISI activities that are not available in Belgium? Please contact us. We will try to make it happen in cooperation with KISIs from another country. These are the musicals that are currently played by the Belgian KISI groups. You think the KISI activities in Belgium are precious and need to continue. Then please support us. You can either donate, pray for us or join our staff. Thanks for your financial support of KISI in Belgium. We train and equip young people so they can bring hope through KISI. We sing and play at places where nobody can pay for it. We produce CDs to give hope to those who can't come to our shows in person. Do you want to support that? We're happy if you support us with your prayer. Please send us an email to let us know you're praying. This will enable us to send you updates with current prayer requests from time to time. Yes, I pray for you! Maybe you are our new staff member? We would love to welcome you in our team. Just send us an email that you're willing to volunteer (and where you would want to help) and we'll get in touch. Do you have any questions, ideas or feedback concerning KISI in Belgium? Do not hesitate to contact us. We're looking forward to getting in touch! Do you want to stay up to date whats happening? Join us on Facebook. Or have a look at those social media profiles of KISI International.